Long before there ever was INM, the resistance movement on Turtle Island has been very active. A highly respected Elder I see, told me “We have never been Idle, I have been resisting Western Society since the 30’s.” I can concur with the Elder on this one, for I too have been resisting for a number of years (not in a very balanced or healthy way mind you). When Oshkimaadziig Unity Camp began in April 2012 on the museum grounds of Coldwater Onatrio, we too were not very “idle”. The person who I am now, compared to the person whom I was back then as evolved greatly. I would like to share a few anecdotes that has helped shape and transform my thinking. I will keep them as brief as possible. On the museum grounds, when were facing off with the OPP and the museum curators, we prayed for militant back up. We prayed for warriors to rise up, and take action with us, or in their own territories. We prayed hard then, and we prayed hard when we moved to Counsel Rock (Awenda Provincial Park). We prayed that our Anishinabek people will be inspired to come and join our struggle. When we began in Coldwater there was 3 Anishinabek men as the organizers. Now after 20 some odd months, I am usually the only organizer, at the camp or anywhere else. I do not blame anyone or anything (I did in the past, and now I have moved on from that). I few months ago, I went to see a healer and as I was dumping my “woe is me” problems on him, he reminded me that “You don’t get what you pray for, you get what you need.” Secondly, I am contrary, so what I pray for may actually be contrary to what I need or even want. I share this anecdote because in the past, I have been harshly critical of the Idle No More movement. I have been harsh on everyone and everything, mostly because I was not getting what “I wanted”. I sought some healing these past few months and I’ve had to take some time off from the camp, and seek this out for myself because I reached a point in my development, where I became counter revolutionary. I became bitter, pissed off, resentful and hateful. I was critical of my own self, and overly critical and pissed off towards all others. The healers that I went to, showed my some doors, and I walked through them. I learned to forgive, and to accept things for who/what/why/how they are. I became at peace with myself, and I no longer feel or act so harshly or critically at myself or anyone else for that matter. My thoughts on Idle No More, is that I got what I prayed for. I prayed hard for the people of Turtle Island to wake up, and they did (I didn’t get the militant warriors that I prayed for mind you). I prayed hard for my own people to come and mobilize at the Oshkimaadziig Unity Camp…what I got was a few less Anishinabek organizers, and a few more European descendants. These European descendants have become so close to me, and I to them, that we no longer see each other as “allies” but we see each other as family. (See my article on Settler Allyship vs Settler Brotherhood/Sisterhood). I was reminded, that everyone is spirit, and that my “lesser tanned” families all carry Anishinabek spirits, and so I did essentially get what I asked for. I asked for my people, and they came. 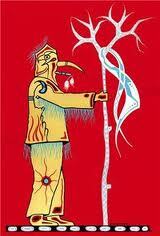 (Theres a strange Windigokaan teaching in all of this, that I needed help and direction to see it). Idle No More is what it is, I will not speak critically or harshly about them or the movement anymore, as the Aatisokaan are directing me to different path. I am being prepared to be a “people helper” and I see no “help” in being critical of them when so many others already are. I know what my path is, and I know what I am after. I am true to the Biskaabiiyaang (decolonization) process that I set out from the very beginning. It is a long hard struggle, and I suffer greatly doing so, but it is absolutely necessary. Some of us, have to commit to this sacrifice, go through the agony of putting ourselves out there to get hurt, scorched and burned, to know that that is not the way…or to find an easier way. I am Windigokaan, we sometimes have to show people “how not to do things”, by actually doing those things. I was harshly critical, and the instructions from my Superiors/Elders have been…”that is not how to do things.” I have given that lesson, I have learned from that lesson, and now it is time for me to move forward (or backwards) and continue on. When it comes to protesting an round dancing, I just let the people do their thing. We all have free will, and the people will do what they think is most effective. In the case of Oshkimaadziig Unity Camp, that is a true Windigokaan practice and teaching. If everyone is on the reservation, and in the urban areas, then I have to be doing the opposite. If everyone is round dancing and protesting, then I have to take no part in it. What I am after and creating is building communities, but that process, first has to begin with myself. I have a community with me at all times. There are spirit guides and helpers that are with me (and you) at all times. I have learned to start building this community with them, and myself. And for me, that is to forgive accept, live the 7 Grandfather teachings and continue moving. My progress in the last 2 months has been accelerated by the healers, and helpers that walk with me, and I am forever grateful. I have learned to accept things for the way that it is, and that everything is exactly the way that it is, for reasons that are already destined to be. I have to walk the path that I am on, and right now, that path is to help build communities. And If im not walking a good kind, path, then what kind of community am I trying to build? Windigokaan Teachings and learnings for me are often times very lonesome, hard and confusing. I just have to wade through it all, wrap myself in the learnings and unlearnings, until receive the teaching. Sometimes I am required to show people what not to do by doing it, and other times I am required to actually show people what to do by doing it. This way of life, must be very confusing for you, as you never know exactly what you are going to get. But know this…I am an Anishinabek man, on the path of Biskaabiiyang, I will falter, I will fall, I will pick myself up and carry on., and I will continue to show you what not to do….learn the teaching, and then show you what to do by doing it. But I will never tell you what to do. You have to choose your own path.